I’ve had lighter biscuits but I love these chewy heavyweights, especially under gravy that smothers shaved smoked ham. Everyone’s hitting on my mac’n’cheese side (jealous of my brilliance in choosing it as a starter). It’s a lot like my mom’s, not too cheesy, not too rich, really crusty on top. 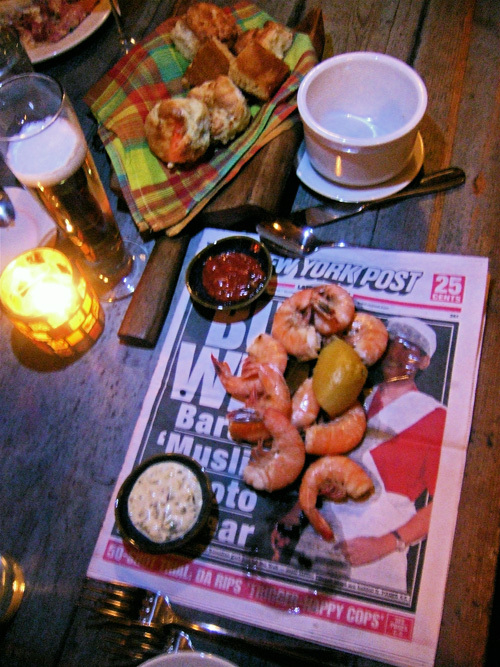 Big boiled Carolina shrimp in the shell with sauces for dunking, ideal for sharing, actually suggest a practical way to extend the useful life of the New York Post they’re served on. And the cheeseburger on its idiosyncratic square roll with first rate fries is more carefully cooked tonight than on our earlier visit – plump and rare, a triumph. Our fussy meat-eaters, me among them, have raves for garlicky hanger steak with creamed spinach. And that juicy hen is no little runt like the baby birds you get around town – it’s a grownup. Our friend is taking half of it home, for the dog, she says. There are new desserts to replace those everyone hated, that swampy apple pie, the oomphless red velvet cupcakes. Curren’s pastry cook-fiancée, Catherine James (he proposed a few weeks ago at Le Bernardin), left Cookshop to join him here. They’re both from Texas and met at the CIA. Big portions and lowish prices – entrees $16 to $25.95 -- seem crucial to me in judging this see-saw affair, plus we can use another all-day spot for breakfast up here. It starts at 8 a.m., slides at noon into lunchtime salads and sandwiches available till 5 p.m.
“We want to be neighborhood and user friendly,” is Waxman’s mantra. He’ll keep coming around to taste what Curren is up to, but his mind, he admits, is already distracted by the next venture. What it might be, he refuses to reveal.